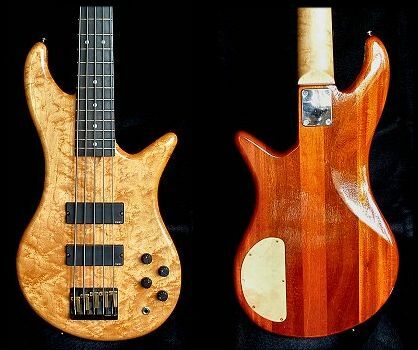 I started making my own bass bodies some years ago for two reasons: The first was the ever-growing price of "good" basses; Secondly, my musician/chiropractor friend, Dr. Steven Blomerth, told me that I could have less back trouble if my basses were balanced and not neck-heavy. He was right. Ten-piece Mahogany body with bookmatched birds-eye maple top. Warmoth neck. EMG active electronics. Original design. A photo and story of this bass are currently in Warmoth's gallery page under "Gecko" on their site. Maple center block running the length of the strings, with ash wings. Warmoth neck. EMG active electronics. Ash Body. My favorite neck, a one-piece maple Fender Precision neck. EMG active electronics. My first attempt. Still sounds lovely. Ash body, Fender Precision fretless neck. EMG active electronics.